The Bostwick Consistometer is a vital piece of quality assurance equipment. 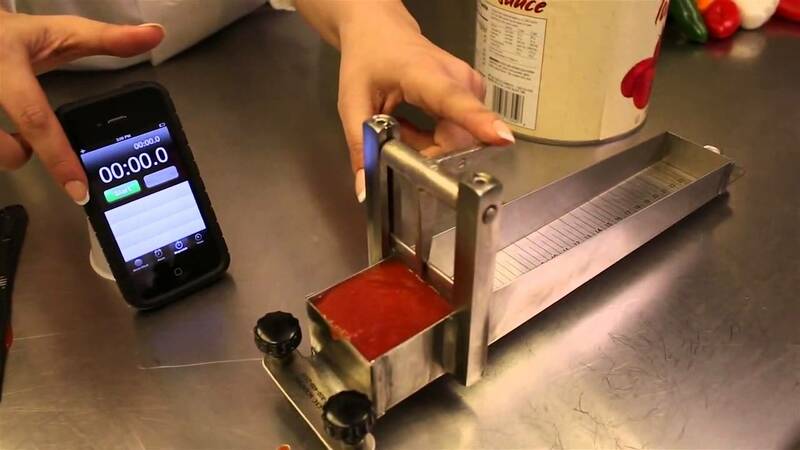 It is used to measure the consistency and flow rate of viscous products, such as jams, dressings, preserves and sauces. In terms of standardising the output of such products, the Bostwick Consistometer is invaluable. Its applications are generally found in the food industry. Note: It should not be confused with other types of consistometer, such as those employed in heavy industries for testing the relative thickening times of mud or cement at varying temperatures. 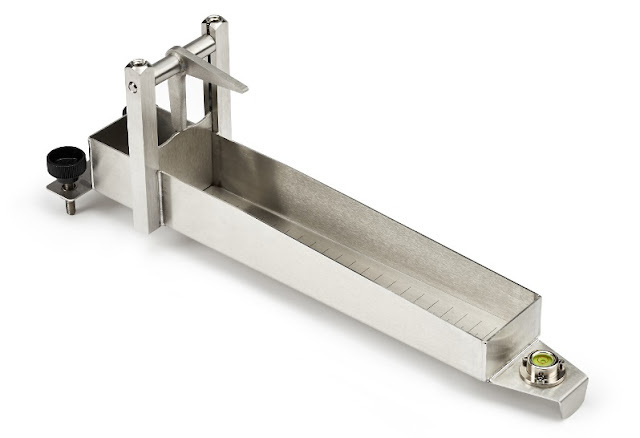 The stainless steel Bostwick Consistometer works through measurements of time and distance, employing a reservoir, spring-loaded gate and trough. On standard models, the trough measures 24cm and has 48 graduations at 5mm intervals. However, for use on thinner products such as soup, the deployment of extra-long models is advisable, which generally has a trough of 30cm, with 60 graduations at the same intervals. The excellence of a Bostwick Consistometer lies in its simplicity. The test which it enables is the measurement of how far a sample of a viscous product is able to travel under its own weight in a given amount of time. Usually, this is set as a control at 30 seconds. In order to ensure standardised controls across tests, the trough must not be on variable inclines. Therefore, Bostwick Consistometers come with in-built adjustable levelling feet and an integral spirit level. The gate is set. This entails pushing it vertically downward against the force of the springs until it touches the bottom. The gate is then held in place with a positive release mechanism, which is essentially comprised of two metal arms protruding at 90 degrees to one another from a horizontal swivel bar. The tip of one arm is placed on the top of the gate when it is down, wedging both the release mechanism and the gate in place. The reservoir is then filled with the sample to a controlled point. Generally speaking, this is to the top, which equates to 95ml. This is an important control, as it ensures there is an equal volume of each product tested. The timing device is then readied. Usually, this will be a stopwatch. The next stage has two parts, which occur simultaneously. The gate is released by pressing down on the second arm of the positive release mechanism. As this moves the first arm off the top of the metal gate, the gate will spring vertically upwards, allowing the sample of product to instantly begin flowing down the trough. In the same moment, the timing device is started. Allow the sample to flow down the trough for 30 seconds. When 30 seconds have expired, note down how far the sample has travelled. With this measurement of distance and time, and knowing that future tests will be controlled if your Bostwick Consistometer is of good build quality, you will be able to know the relative consistency and flow rate of a viscous product. Bostwick Consistometers are a simple, portable, reliable and invaluable tool for any commercial venture which pursues standardisation in their production or use of viscous food stuffs.